Subsection (d), however, provides a caveat that, if the automobile driver cannot provide three feet, they are still allowed to pass the bike but, they should, “slow to a speed that is reasonable and prudent, and may pass only when doing so would not endanger the safety of the operator of the bicycle, taking into account the size and speed of the motor vehicle and bicycle, traffic conditions, weather, visibility, and surface and width of the highway.” This allows for the possibility of less than three feet but, only if speed is reduced and the passing maneuver is done in a way that is safe for the biker. What many motorists don’t realize or forget is that bicycles are considered “vehicles” under existing law and have the right to use most roadways and surface streets. (California Vehicle Code 21200). They are encouraged to stay to the right hand side of the road as much as possible but, are allowed to “take the lane” as necessary in the following circumstances: (1) To overtake or pass another bicycle or vehicle traveling in the same direction; (2) to prepare to make a left hand turn at an intersection or into a public or private driveway; or (3) when approaching an area like an intersecting roadway where a right turn is authorized. (California Vehicle Code 21202). In addition, subsection (d) of the code mirrors the language in the “basic speed law” statute, which already requires persons to travel at a speed that is safe for all roadway conditions including the existence of bicycles traveling in the same direction. (California Vehicle Code 22350).Therefore, the law requires motorists in cars, trucks and SUVs to share the roadway with bicyclists. Requiring a reasonable distance when passing a bike seems to be in line with this concept. 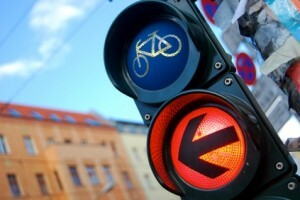 What Was the Impetus for This Change In the Law On Cars Passing Bikes? Cycling advocates have long felt that drivers too often are impatient when they get behind a person on a bike. The bike rider is obviously going much slower than a car and they want to get around the bike as quickly as possible. This leads to aggressive driving to pass the cycle. Without a set standard distance for what is a safe passing buffer distance being defined in the vehicle codes, they contend that cars will continue to pass bikes with too little margin for error and at speeds that can cause bike wrecks. As an attorney that has represented numerous injured cyclists throughout California, I tend to agree. I have seen motor vehicles passing too closely and too fast as a major cause of bicycle crashes resulting in serious bodily injuries like concussions and fractures as a result of the cyclist being run off the road or trying to avoid a collision and being ejected from the bike. Los Angeles recently had a public advertising campaign that encouraged motorist to share the road with bikes. “Every lane is a bike lane” was one of the themes. Motorist need to acknowledge bike riders rights to use the road. Bicyclists, on the other hand, need to be cognizant of the fact that they travel slower than cars and keep to the right as much as possible except when safety dictates otherwise. AB 1371 (now the newly revised CVC 17150) is a public policy statement that we all need to watch out for the safety of our bikers and pass with care!